Portofino Beach Resort is a boutique resort located on a stretch of white sandy beach on the north end of Ambergris Caye. Away from the crowded beaches in San Pedro Town, it’s quite location is perfect to get away from the hustle and bustle of everyday life, and more importantly, to fully relax and rejuvenate. Offering 17 beach rooms with authentic hand thatch palapa roofs, a gorgeous fresh water swimming pool, fabulous restaurant, PADI Dive Shop, and outstanding personalized customer service, Portofino offers a unique guest experience. Our very own ‘Portofino Restaurant’ is one of the most popular restaurants on the Island. It is located on the second floor of our main building, offering spectacular views if our Design Freshwater Pool, Caribbean Sea and the Barrier Reef. 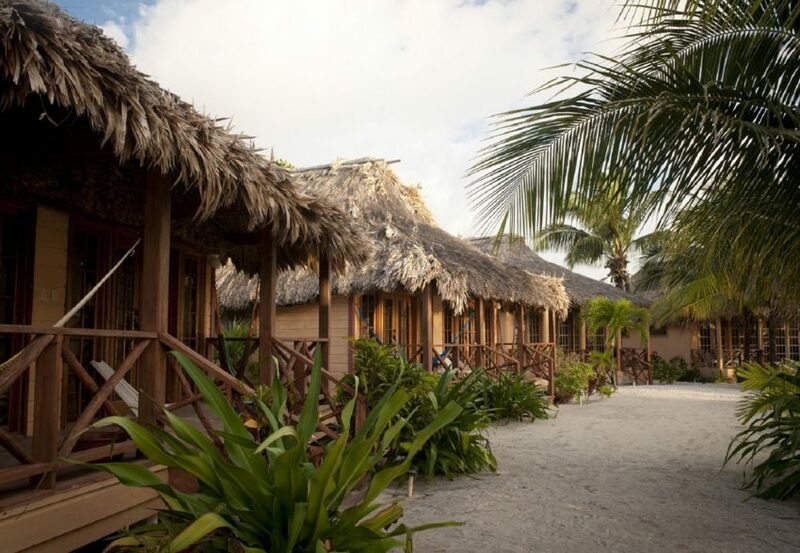 Portofino Beach Resort offers some of the most adventurous and exclusive tours in Belize. Activities include guided day trips to Mayan Ruins, Cave Tubing, and fishing, just to mention a few. All our tours and trips depart from our dock and are provided by professional and well experienced tour companies and guides. Belize offers its visitors world-class diving as we boast the largest barrier reef in the Western Hemisphere, second largest in the world. PORTOFINO offers various types of accommodation, each offering amazing views of the Caribbean Sea and the longest Barrier Reef in the world. 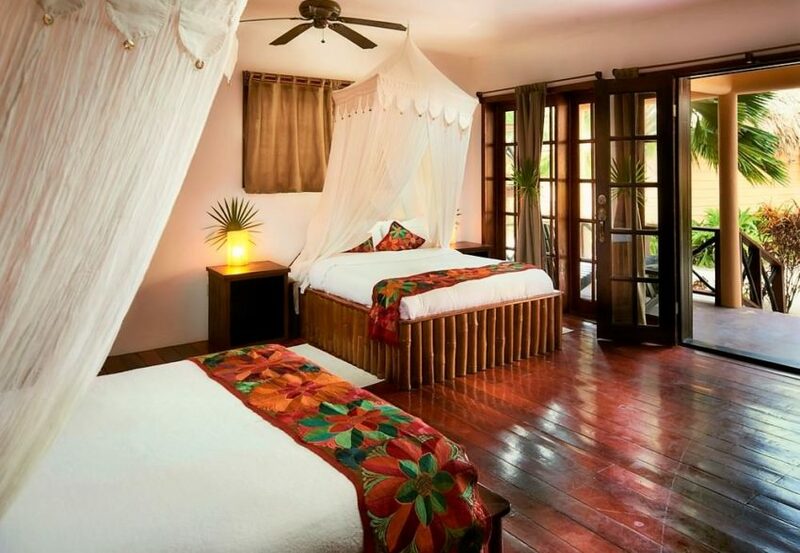 Each room has a porch with chairs and hammocks where you can delight in some of the most beautiful Caribbean Sunrises. To the rear of our property, where you can also appreciate some of the most beautiful sunsets, lies the lagoon, home to an assortment of rare tropical birds and the occasional Crocodile. Portofino Restaurant– Our chef uses fresh local produce, seafood and imported meats. Set in the sand, only footsteps away from the crystal clear waters of the Caribbean Sea and the magnificent Belize Barrier Reef is our charming Beach Cabanas, offering breathtaking views of the Caribbean and our gorgeous swimming pool. These buildings are set up as duplexes. Each one is comprised of two Beach Cabanas that are side by side, each measuring 400sq feet. Each building has a shared porch with wooden chairs and hammocks, where you can relax and feel the soft caress of the tropical breezes, and delight in the most amazing sunrises. 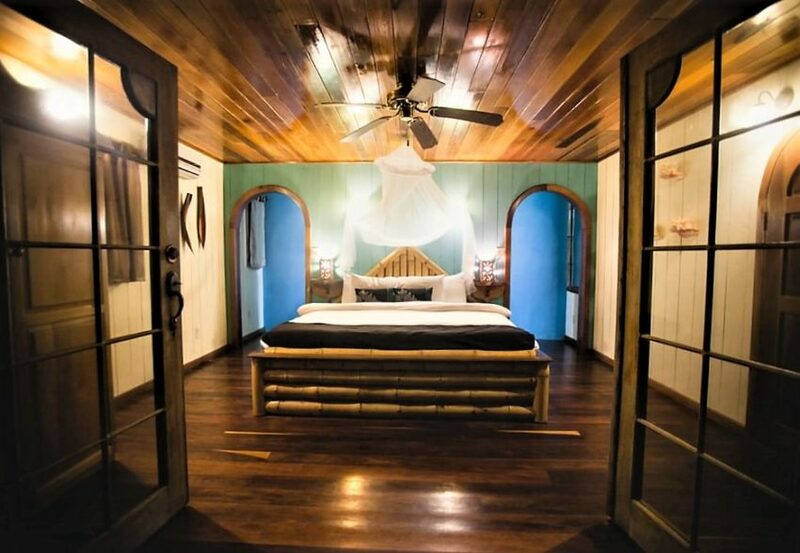 Authentic hand thatched Palapa roof, individual artwork from talented local artisans, custom made furniture and exotic hardwood floor capture the essence of Belizean charm. Each has a large king size bed, and a super soft cover for added comfort. Spacious private bathrooms with walk-in shower feature a stunning hand painted talavera sink surrounded by beautiful concrete counter top. Offering 800 sq feet of interior space, Royal Orchid is a magnificent suite located on the second floor, facing the beautiful Caribbean Sea. Featuring massive glass floor to ceiling windows, a large private balcony with hammocks and chairs, the suite looks far out over the Belize Barrier Reef and into the deep blue sea which seems to seamlessly blend into the clear blue skies. Inside, a custom made four poster king size bed draped with decorative netting and a luxurious cover, is set in the center of the room facing these astounding views. Its hand thatched palapa cathedral ceiling is nothing less than stunning. Beautiful hardwood floor flows throughout the entire room. Spacious private bathroom with walk-in jungle shower feature stunning his and hers hand painted talavera sinks surrounded by beautiful concrete counter top. A Large French window set over the romantic custom made soaking tub frames the canopy of the lush tropical palms outside. The Royal orchid is the perfect romantic tropical hideaway for honeymooners or couples just wanting to relax, reconnect and rekindle romance. Measuring 600 sq feet, our Treetops are stunning suites that are elevated on the second floor. Massive picture windows line the front of this suite, letting in the breathtaking views of the Caribbean Sea that seamlessly meets the clear blue skies. French doors open to a large private balcony with chairs, hammocks and a table where you can enjoy private dining. 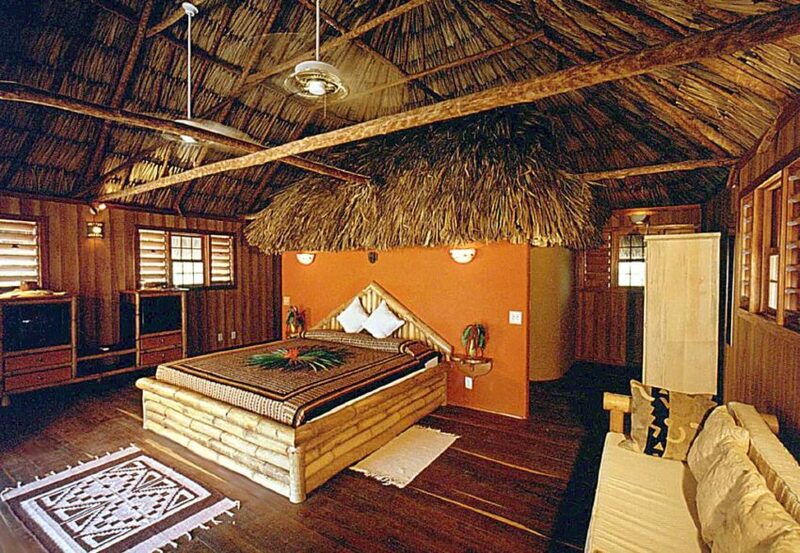 A marvelous hand thatched palapa roof ascends 18 feet in the air and beautiful exotic wooden floors showcase natural beauty and create a dramatic effect. A custom made Bamboo king size bed draped with decorative netting and a super soft cover for added comfort, is the centerpiece of this room. The treetop offer s a wonderful bathroom with lovely hand painted double sinks, featuring rainfall shower head and robes. Next to the bathroom is a dressing area with a reach in closet. 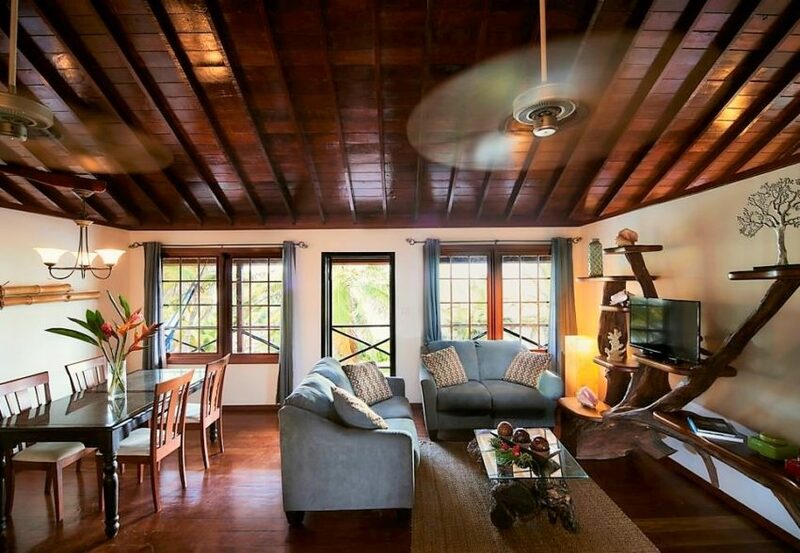 Located just below the Treetop Suites, our 800 sq feet Colonial Suites offer partial Caribbean views. 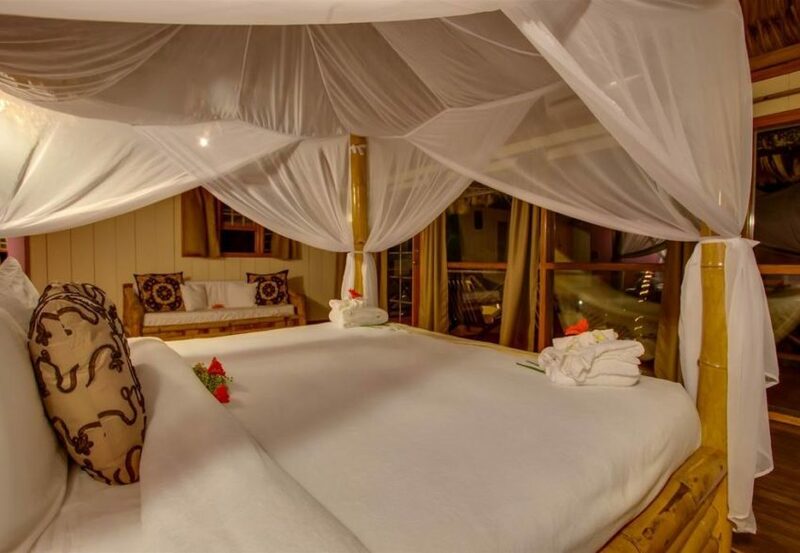 Featuring a large private balcony with chairs and hammocks, these suites are just perfect for those seeking accommodation with multiple bedding. Each offer two queen with super soft covers, a dressing area with a reach in closet, and a sitting area with cushioned custom-made bamboo chairs. Beautiful hardwood floors flow throughout this spacious room that is outlined with large French windows and doors that let in the dancing sunlight, making the Colonial Suites refreshingly light and airy. Onyx light fixtures give an added touch of luxury. This beautiful 4-bedroom beachfront villa consists of 2 floors and is located right on the beach facing the glistening Caribbean Sea. The beauty of the Portofino Beach Front Mansion comes from the architectural details of the home, that were inspired by the old traditional colonial homes – simple Belizean elegance, spacious floor plan, large front porches with hand carved wooden chairs, Mahogany wooden French windows and doors with unobstructed views of the Caribbean Sea. The air-conditioned beach home sleeps up to 6 people on the first floor and up to 4 people on the second floor. This is the perfect beachfront home for families or groups of friends that want to be together.